Instructor User Guide Tests and QuizzesHow do I view and modify the settings of an assessment? The settings of a test or quiz are complex, and offer many options. In many cases, the default values will work, but should be reviewed. The modification of a setting in one section will not change settings in other sections. You can modify the settings, parts, and questions of any assessment listed under the Working Copies tab. When you publish an assessment, a copy is created and listed under Published Copies. For the published copy, you can make changes to all the settings except "Assessment Released To". Note: After you've published an assessment, if you modify the unpublished version under Working Copies, you'll have to alter the assessment's name before republishing it. When you publish it, you'll be creating another publication under Published Copies, not replacing the existing published copy. Also, if you modify the settings of a test while students are taking it, the changes will not affect testing sessions in progress. Students must exit the test and re-enter it in order to have the modified settings take effect. This is a list of the options available in the assessment settings. Click on the small triangle next to each section to expand/collapse that section. Or, you can click on the Expand All link to expand all of the settings sections at once. The first section is the Assessment Introduction. This is where you can change the title of your assessment if desired. Optionally, you may also add a description. 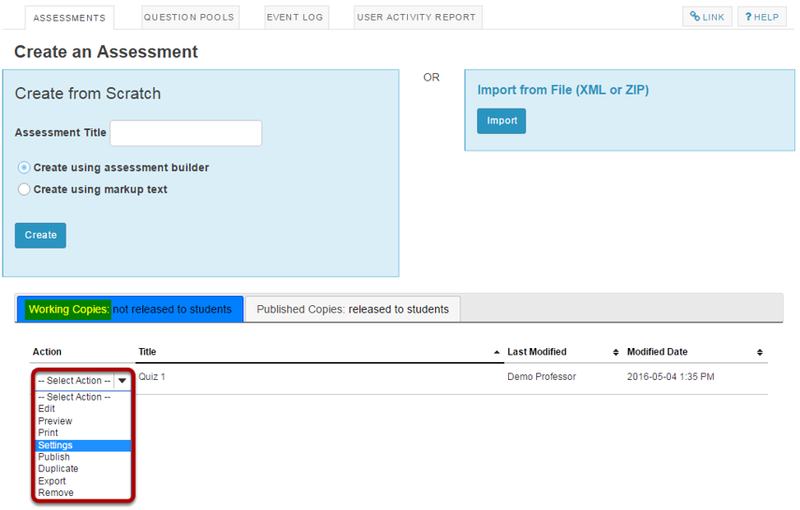 Anything you enter into the description field will be visible to students before they begin the assessment. Notice that the Rich Text Editor is available in the description field. If selected, the Honor Pledge requires students to agree to the pledge before beginning the assessment. You can attach a file if you like. The file could be a reference the students need to use during the test, or more detailed instructions on test taking requirements. The Metadata section may be optionally expanded to enter additional information about the assessment. The availability and Submission section controls when your assessment is available and which users have access to it. Note: If you release an assessment to anonymous users, you must distribute its URL to participants; it will not be accessible from within your site's Tests & Quizzes tool. The URL will be presented when you publish the assessment. Exceptions to Time Limit and Delivery Date. Zoom: Exceptions to Time Limit and Delivery Date. If you would like to allow individual students or groups of students to have different date or time settings, you may click on the Add a Time Limit/Delivery Date Exception link to add one or more exceptions. Once you click the add exception link, you will be able to select users or groups within the site and indicate the time of amount allowed for that user/group. In addition, you can check the box next to Change Delivery Dates for the group/student to specify a different availability window for the assessment. Tip: The add exception setting is most often used for students with disabilities that require extra time on the test. The delivery dates let you specify the availability window for your assessment. 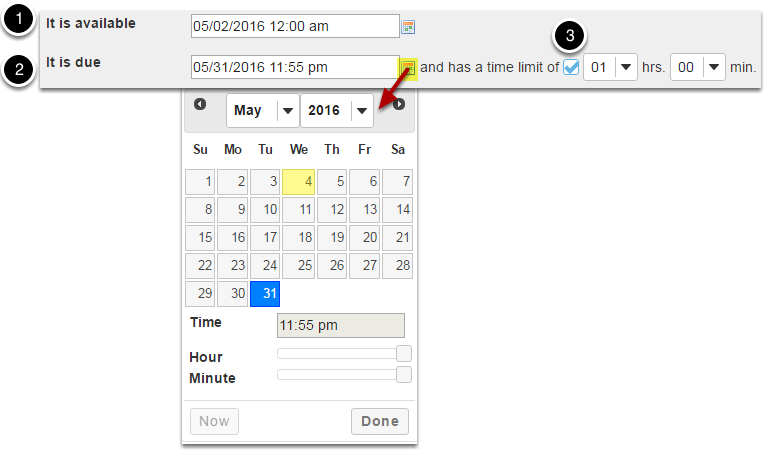 You may enter the dates into the fields provided, or use the date-picker (calendar window) to select a date and time. The Available Date is the start date of the exam window. Students will not be able to see the assessment before this date. The Due Date is the end date for the exam window. Students will not be able to submit after this date unless you allow late submissions. If late submissions are allowed, any submissions after the due date will be marked as late. 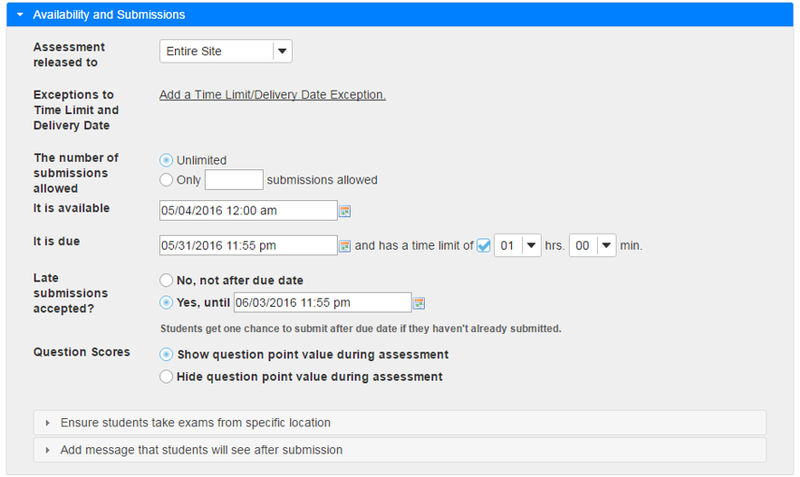 If you would like a Time Limit on your assessment to be timed, select the check box for has a time limit of and select the desired time in hours and minutes from the drop-down menus. Tip: If you want an assessment to always be open, you may leave the date fields blank. Choose whether or not you will accept late submissions. If you do allow late submissions, they will be marked as late if they come in after the due date. Use the date picker to select a deadline for late submissions. Choose whether or not you want the point value of the questions to be visible to students while they take the assessment. Exam security by location or password. Zoom: Exam security by location or password. You may restrict the assessment so that only connections from certain IP addresses are allowed, such as the testing center on campus. Enter one IP per line. Asterisks may be used to stand for any single subnet. You may also specify an additional password for the assessment. This information is typically provided to a proctor who enters the information for the student at the testing center. Note: The password here is intended for this specific assessment only. It is NOT the instructor's or the student's login information. If you would like to enter a message that students see upon submitting their assessment, you may do so here. The rich-text editor is available if desired. You may include a URL if you like. The URL link for this page will be displayed after the student submits the test. Check this box if you want assessments to be auto-submitted after the retract date. Note: You will only see this option if it is enabled on your instance. This section deals with the grading and feedback options for your assessment. If you allow multiple attempts, select the type of score that you want to be recorded in the gradebook for that assessment. The default setting here is for anonymous grading to NOT be selected. In most cases, you want to keep this setting, since there is no way to revert to student names once they have submitted the assessment anonymously. However, if you are using the Tests & Quizzes tool to deliver a survey in your course, you may want to make the survey submissions anonymous by checking the box to Hide student identity from grader. Select this box to send grades to gradebook if you want to be able to calculate them as part of the course grade. Note: If you select this option, students will be able to see their assessment score in the Gradebook immediately upon submission, regardless of the feedback settings selected for the assessment. For Feedback Authoring, the default option is Question-Level Feedback. This allows the instructor to author feedback at the question level. You may also choose to display Selection-Level Feedback (i.e. feedback per answer choice), or Both. 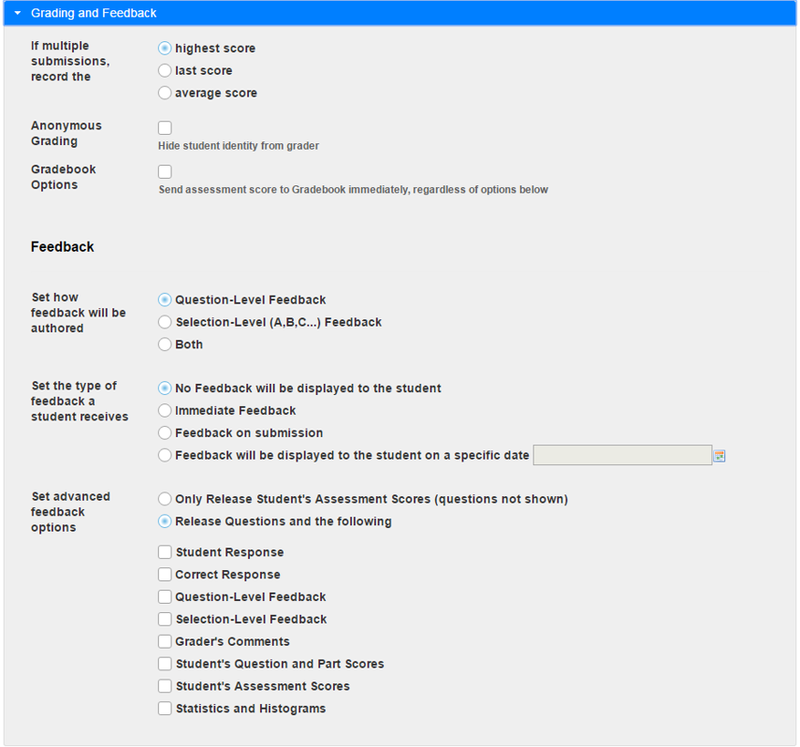 Feedback Delivery controls if and when students are able see their submission results. No Feedback (the default setting) does not display any feedback to the student. Immediate feedback is recommended for self-tests only, as it will display the answers immediately - PRIOR to the student submitting the assessment. Feedback on a specific date releases assessment feedback upon the date and time specified. Tip: If you are concerned about students sharing their exam results with one another, you should choose either No Feedback or Feedback on a specific date. For the latter, selecting a date after the closing date for the assessment will prevent students from sharing feedback with other students who have not yet taken the test. You can also decide how much feedback you want to release to students. You can choose to Only Release Student's Assessment Scores so that they only see their grade on the assessment, not individual questions. Or, you can choose to Release Question and the following and then select the items that you want students to see from the list below. Check the box next to any items you want students to see. This section has to do with the appearance of the assessment and how students navigate through the test. Navigation controls how students proceed through the test. The default is Random access where students can navigate through the test with Next and Previous buttons, as well as a Table of Contents. 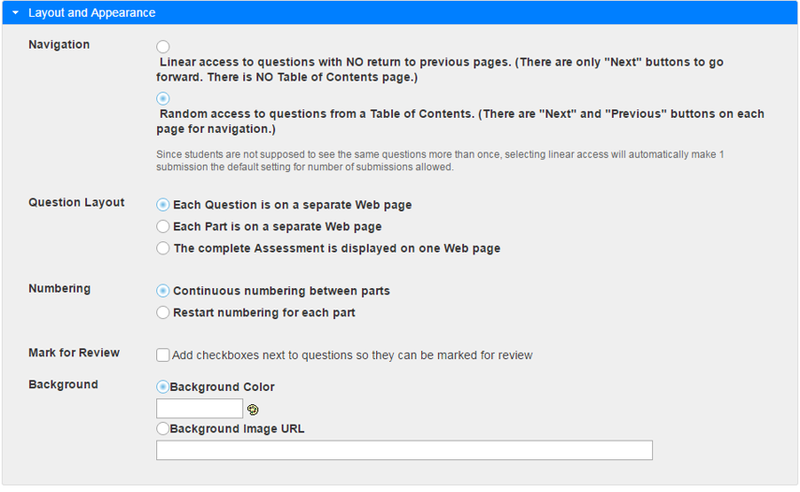 You may change this to Linear access if you prefer, where students can only go forward using the Next button and cannot revisit earlier questions or access a Table of Contents to jump to a question. You can control the presentation of the questions according to the options shown. To display the entire assessment on a single Web page, allowing students to scroll through it, click the third choice. Tip: Each question on a separate page is typically the preferred setting. Choose the numbering pattern here. Numbering can be either Continuous throughout the test, or can Restart for each part. (For example, if you have multiple parts in the exam and the second part is for essay questions, you could have the numbering go back to 1 for the first essay question.) If you restart numbering for each part, questions are numbered with the part number, then the question number. If you want to allow students to mark questions to go back to, check the box for this item. Students may use this option to mark questions that they aren't sure about, and then jump back to them via the Table of Contents to review before submitting. Note: You cannot allow Mark for Review if Linear access navigation is selected. You can choose a color or image for the background here. To select the colors, click the palette icon. The image is given by a URL. An image smaller than the screen will be tiled for to cover the entire screen area. Note: It is typically a best practice to leave the background of the assessment a solid color which provides good color contrast between text and background (e.g. a white background with black text) so that students can easily read the questions. Background images may make the assessment difficult to read if images compete with the text. Save and publish the assessment. When the assessment settings are ready, and the questions are in place, click Save Settings and Publish to publish the assessment so that your students can take it. If you are not yet ready to publish, you may click Save instead to save your settings without publishing. See the article How do I publish an assessment (i.e. test or quiz)? Next: How do I publish an assessment (i.e. test or quiz)?